ABAB’s regular reader (thank you – the cheque’s in the post) will know that my knowledge of art could be sketched on the back of very small postage stamp. 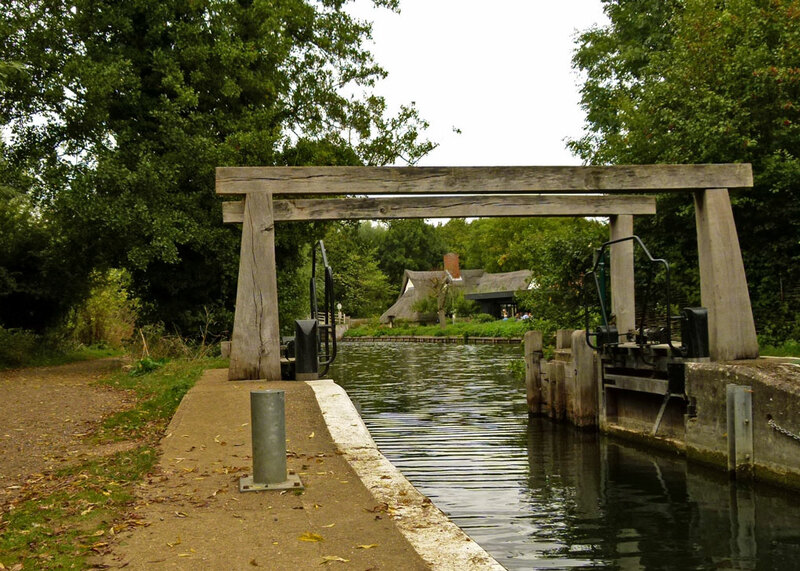 Nevertheless, in the endless pursuit of intriguing stories and occasionally stimulating bits of Britain, which may attract and amuse, the intrepid Bit About Britain team set out for Flatford Mill. 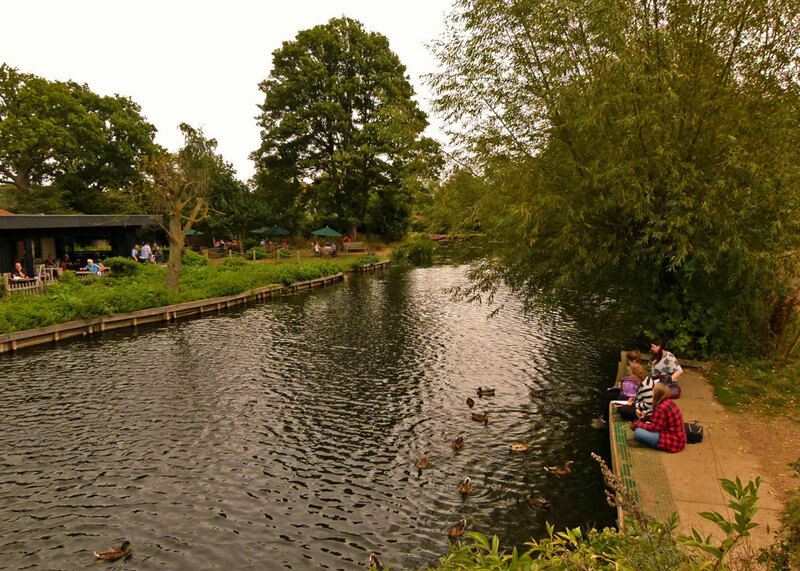 Flatford, as you art-buffs know, is on the River Stour in Suffolk, close to the border with Essex, and the area inspired many of the paintings of John Constable (1776-1837). This is Constable Country. 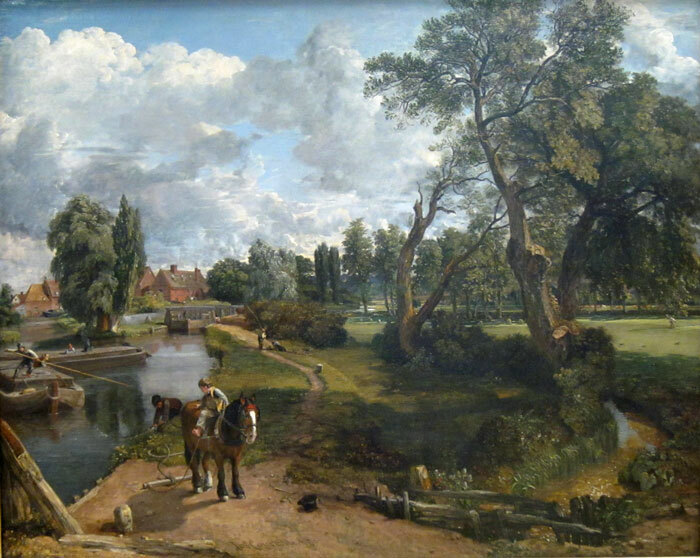 John was born in the village of East Bergholt, the second son and fourth child of a relatively wealthy corn merchant, Golding Constable, and his wife Ann, Golding Constable owned Flatford and Dedham mills and John could have had a future in the family business. But his heart was in art. As a youth, he would paint and draw with his good friend, John Dunthorne, the local plumber and glazier, who was himself a talented artist. Eventually, in 1799, Constable persuaded his parents to let him attend the Royal Academy and the rest, as the cliché goes, is history. Images of the originals, all of which are apparently in the public domain and are shown courtesy of Wikipedia, have been included for comparison. 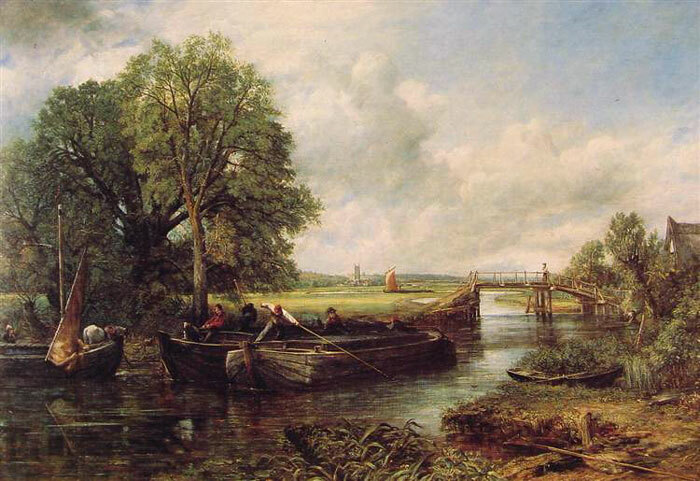 View on the Stour near Dedham (1822 – currently in the Huntington Gallery, San Marino, LA, USA). The Hay Wain (1820-21, currently in the National Gallery, London). Scene on a Navigable River (1816-17 – currently in the Tate Gallery, London). Boys Fishing – (1812 – currently held by the National Trust at Anglesey Abbey). 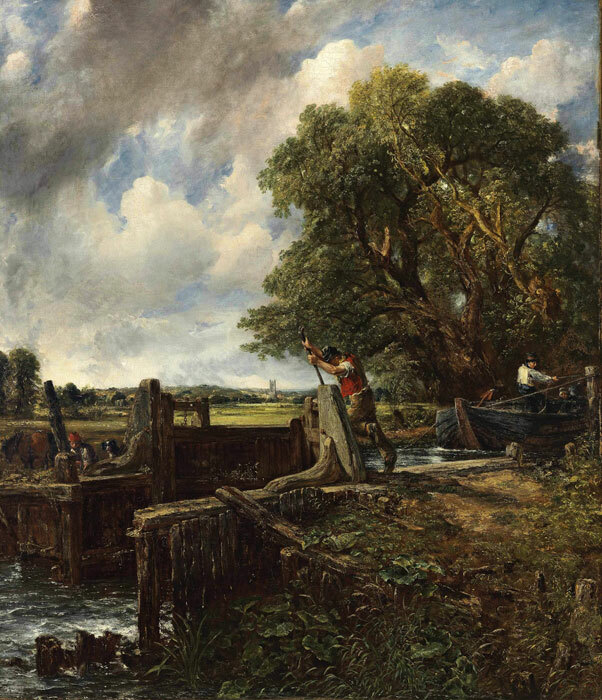 A Boat Passing a Lock (1826 – currently in the Royal Academy, London). 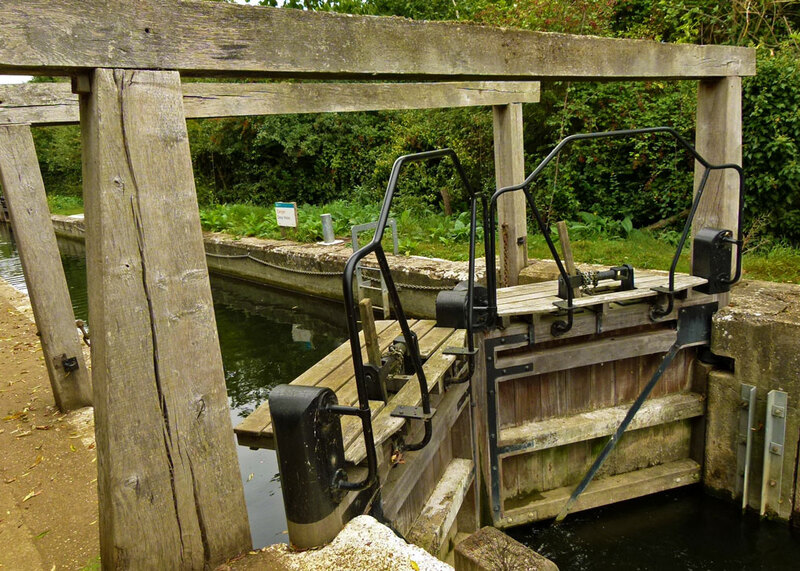 A Boat Passing a Lock today – sorry, no boat. 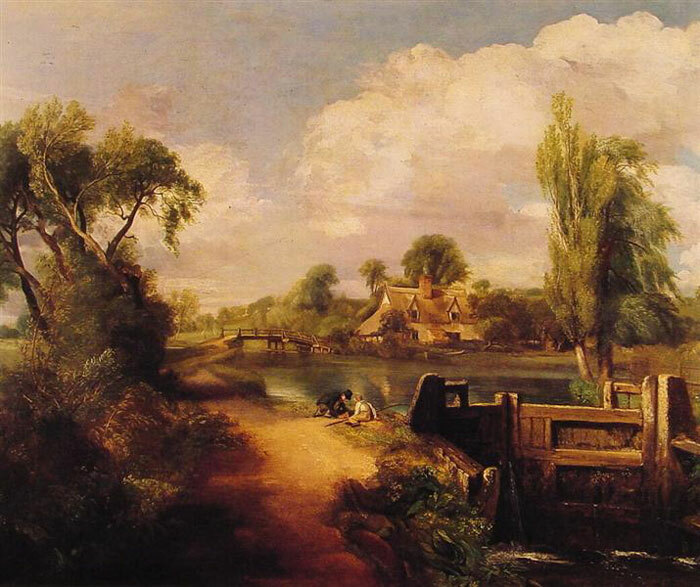 Flatford Mill from the Lock (1811 – currently in the Victoria and Albert Museum, London). 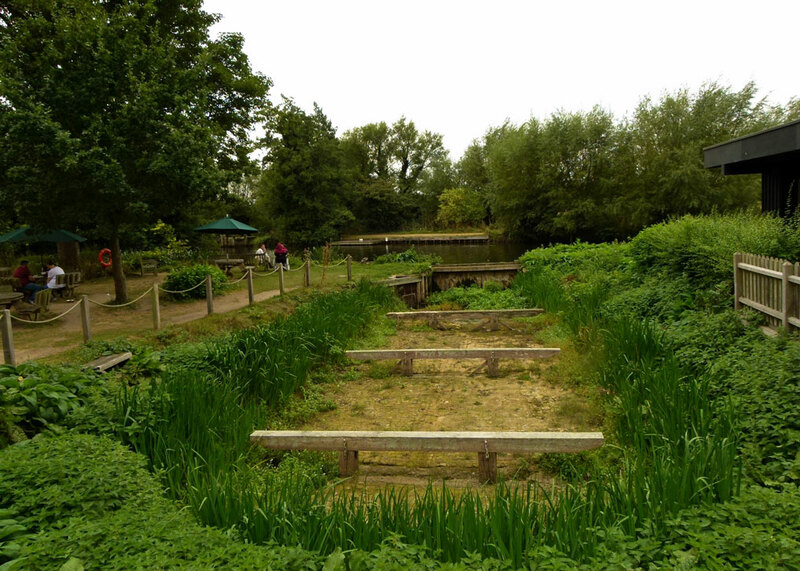 As you can see, the area Constable painted was much more industrial than it is now – and considerably less overgrown. 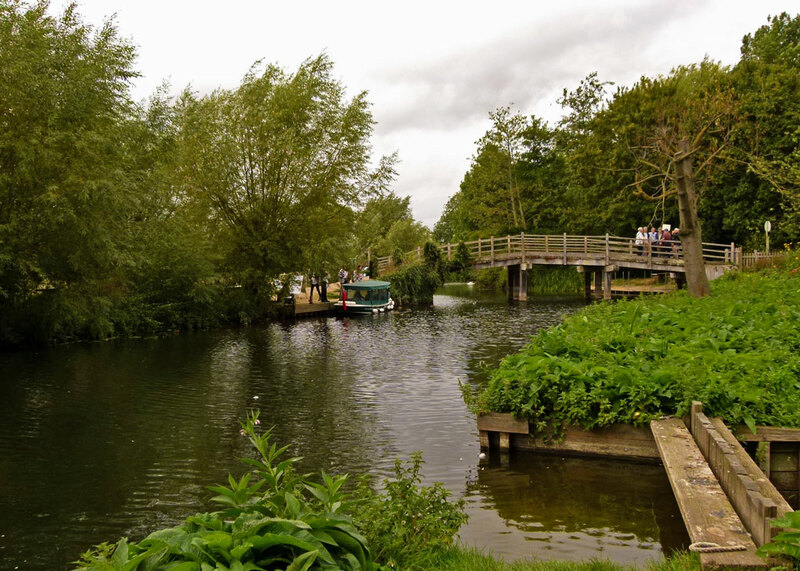 There are several walks thereabouts in Constable Country, but we didn’t want to spoil you by showing too much pleasant scenery, so reluctantly resisted the urge to tramp any further for the Greater Good. 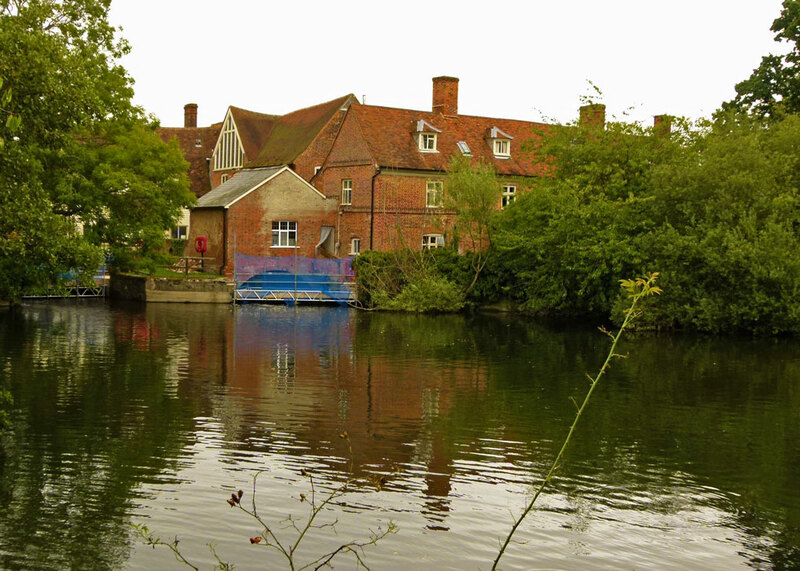 Flatford Mill, Willy Lott’s House (the building featured in the Hay Wain), Bridge Cottage (seen in ‘A lock on the Stour’) and nearby Valley Farm are now all carefully looked after by the National Trust. Apart from Bridge Cottage, none of these buildings is normally open to the public – but they will be featured on a future post. There is plenty of parking nearby (National Trust) and also a small exhibition about Constable and his life. It was when taking the photograph of ‘Scene on a Navigable River’ that I realised the coffee and bun I had enjoyed earlier had been consumed in the modern building you can see in that shot. Hey-ho – that’s progress. Thanks – we really enjoyed trying to match today’s views to the paintings. Love Suffolk – do visit Sutton Hoo and Orford Ness if you get the chance. Delighted to have helped – some of the scenes almost look like old friends to me too. Thanks for visiting ABAB and for leaving a comment. Fabulous shots of the scenery. What a fun project. It’s amazing how much is still there to be photographed. I don’t know if it’s because you’re so good at taking pictures or because Constable was so good at painting nature, but it’s nearly difficult to make the difference between the pictures and the paintings! As others have said to … your comparisons are excellent and give just that bit extra … as you so often do! Thanks, Jan. You say the kindest things! Ah – but you have an artist’s eye! I love the now and then comparisons. It adds perspective to the place. 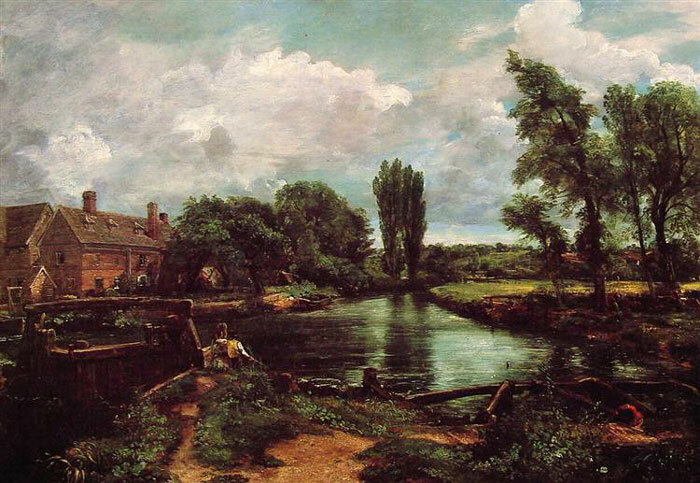 Interesting comparisons between the paintings and the area as it is today – John Constable used to put a tiny spot of red in most of his paintings – a trick that he picked up from his rival Turner. 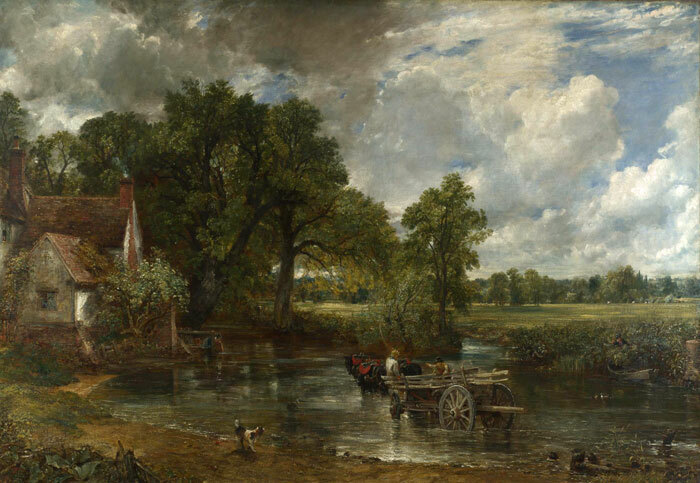 It’s hard to imagine now but Constable’s was the “modern art” of its day. His technique, composition and subject-matter were as controversial in its time as the work of the Hirsts, Gormleys and Emins is now. Of course now that everybody’s copied his style (mostly very badly) it all looks “old-hat”. His technique, if you look closely is looser than what went before and his trees and water can almost look impressionistic. His compositions are often less balanced than earlier paintings and have a certain movement and vitality; trees, clouds and people all look as though they’re on the move. And his subjects are painted very much as they were in his day, even if to us it looks like a rural idyll. And he shares my birthday, so he must be a good egg! You’re looking very well, considering… Interesting comment – yes, everything was new once. Oh thank you, off to learn more about Constable. Beautiful art pieces! 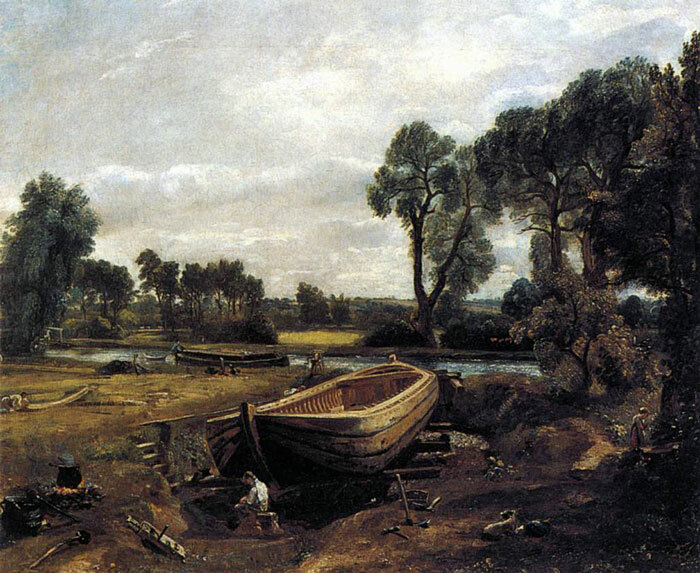 I love the fact that you can find Constable’s views in the landscape today. Nicely done – probably much better than the NT. Thanks, Ellen – hope she enjoyed it. That was certainly interesting, the Then and Now. Constable evidently also saw through romantic, artistic eyes, and probably carried his own bun and coffee with him, in an artsy satchel, to each location. I suppose nowadays the fishing boys are instead in their homes playing computer games. Lovely post, Mike! Good to compare his works to current scenes. Our National Gallery has several of his paintings and sketches, including the Salisbury Cathedral, a church in East Bergholt, and Netley Abbey. I featured the Cathedral at some point from one of my visits. 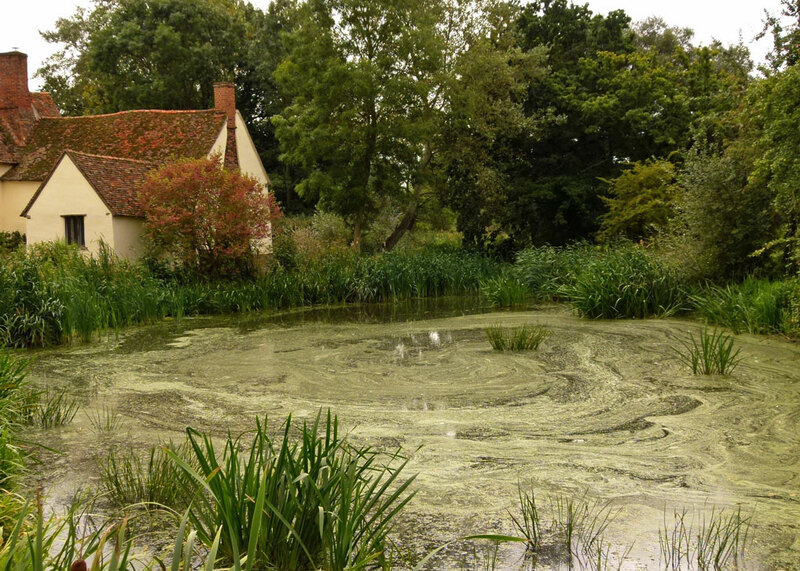 Oh, thank you – they just did a piece on Constable Country in Country Living a month ago, I think. He was certainly quite the artist, and enjoyed seeing the past, his own painted version and then the how it is today. A most interesting and peaceful looking village.